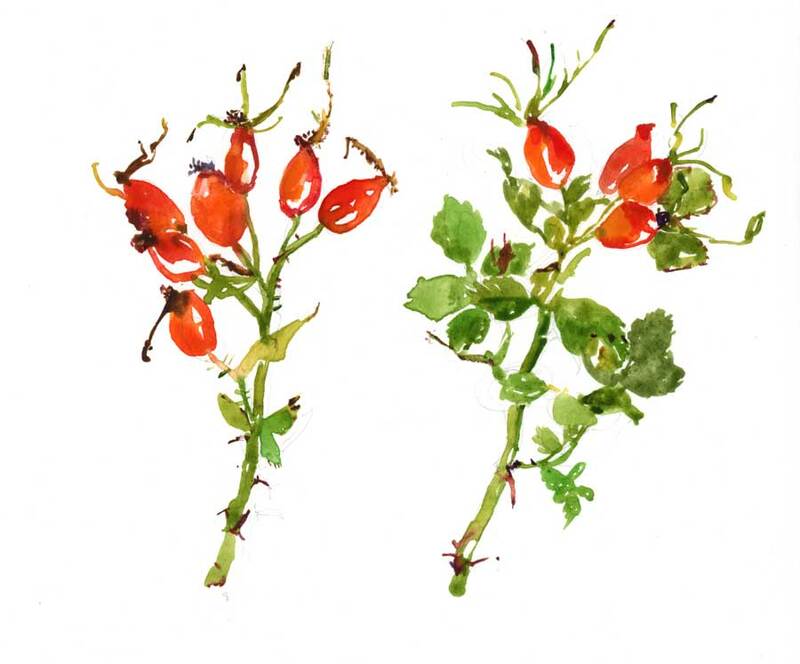 I picked these on Hackney marshes a few weeks ago and brought a few tangled, hairy sprays into my studio. 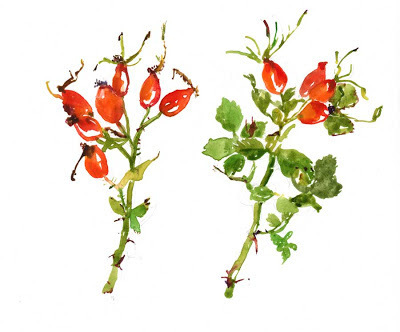 Who knew rose hips smelled so good, they have a kind of orangey apple freshness going on. Partly explains why they are used dried in tea, I guess. And jelly, and, in Sweden so I read, in soup. And as a treat for pet chinchillas. It says so in Wikipedia, it must be true folks. Still working on leaf painting, but for now, this is how my leaves look. I looked through a most worrying selection of how-to books online on greens and leaves, books on botanical illustration and the like, and there certainly are some authoritative publications around. Do this, don't do that, never mix these and so on. Like I said, worrying! Might be better to keep looking at flower painters I love, like Elizabeth Blackadder's work. Still, in the end, the only way to improve leaf painting is most likely to um, keep painting leaves. What say you, any ideas? I say... to enhance the whole experience, or perhaps to distract yourself completely... get a hold of a jar of German Hagebutte spread. I ate mine with a spoon. well now, sourcerer, I will follow that lead. in the interests of research, you understand.